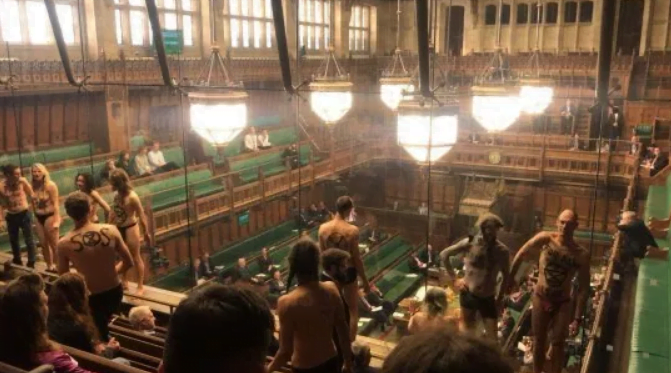 A dozen protesters stripped naked in the House of Commons to bring attention to climate change. Because only a naked male body can truly exemplify when there’s a drastic change in temperature. Despite the intent of the demonstration, the MPs continued discussing the enthralling subject of Brexit. You have to give Theresa May credit for pushing on despite having an a**e in her face. But enough about the Labour leader. Some of the protesters glued their hands to the glass of the public gallery which I can imagine must have looked quite alarming to ministers. The last time the Tory party had to confront a half-dressed man with a sticky hand they were dragging David Cameron out of a pig sty. I’ve always found it weird that there’s a public viewing gallery to the house. It makes parliament look like the worlds worst aquarium where every exhibit is a puffer fish, a jellyfish or one of those fish that eat the skin of backpacker’s feet. Police arrested the protesters on suspicion of “outraging public decency” which I would consider a pretty substantial yarn to yank at considering the location. I doubt they even had 650 pairs of handcuffs. 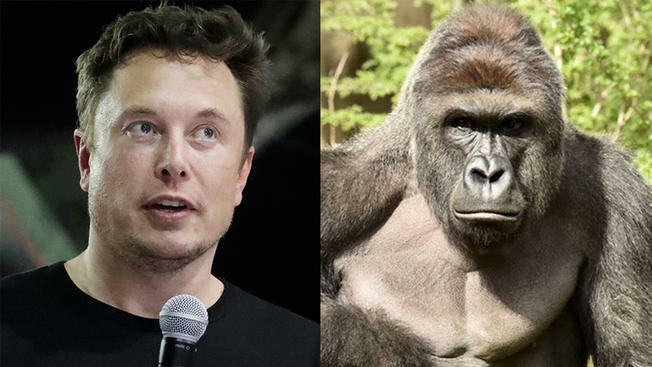 Elon Musk, CEO of Tesla and SpaceX has released a rap song entitled RIP Harambe. Now I don’t know how long Joe Rogan podcasts run for but it appears he’s still on whatever it was. Slightly worrying that the guy in charge of the cutting edge technology taking us to Mars is still using memes from three years ago. His next release Damn Daniel, will no doubt be streaming soon. Channel 4 presenter Jon Snow got in a bit of hot water after remarking about a pro-Brexit rally outside parliament that he’d never seen ‘so many white people in one place’. Presumably, Mr. Snow has never been skiing. Of course, Snow’s remarks were unnecessary. I mean, this is inner London, famously a completely white neighborhood. There are no ethnic minorities in London to my knowledge. There can’t possibly be any other explanation. The demonstration involved a number of far-right groups clashing with police. For people who are very proud to be white, they don’t half get precious when you bring it up. Ofcom is considering investigating after over 2000 complaints were sent in. Crikey. If Jon Snow remarking that a load of white people are white sets the hounds loose, they’re gonna have a hell of a job to do when Westeros’ wall comes down in two weeks. For more of this sort of thing but in limerick form, travel to this hyperlink.